Monica Sauza explains Mexican currency in this 2 part series…. places could not be spent or somehow found a way of staying inside travelers’ wallets. Some bills have amazing designs and speak volumes of their country’s history or eminent characters. 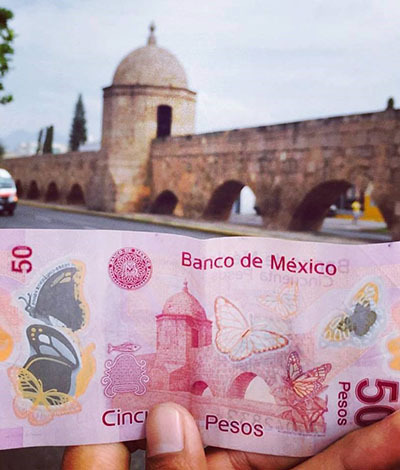 It is definitely worth checking out the Mexican bills as not only do these display beautiful landscapes, architecture and characters that have significantly influenced its past, but also teach us about this country’s places, history and cultures. Last August we learned that a new 500-peso bill was being launched and by 2019 the “New Family of Bills” will gradually replace the ones we currently use in Mexico. These new bills will have stronger security measures and elements. The new series of bills will portray different stages of the Mexican history: Ancient Mexico, Colonial Times, the Independence, the Reform and Restoration of the Republic; the Revolution and Contemporary Mexico. The reverse will include ecosystems that best represent the country and are part of the “Cultural Heritage” (UNESCO). Denominations of the “New Family of Bills” will be: 50, 100, 200, 500, 1000 and, possibly, 2000. Worth of mention is that, due to their designs, more than once the International Bank Note Society has selected Mexican bills among the most beautiful in the world; hopefully the new ones will also be included in this distinguished selection. Although there is no definitive date for these changes and before we say our goodbyes to the bills currently in use and welcome the new ones, we should familiarize with what they depict, mean and teach us about Mexico and also when the changes come, avoid unpleasant surprises. This bill, which was launched in 2007, will disappear and be replaced by 20-peso coins. On the back: the 20 sq. km ancient and beautiful city of Monte Alban, capital of the Zapotec people, considered one of the first and most important archaeological sites in Mesoamerica, founded in 500 AD and declared Intangible Cultural Heritage of Humanity by UNESCO. On the bottom, Cocijo, the Mixtec and Zapotec god of water. 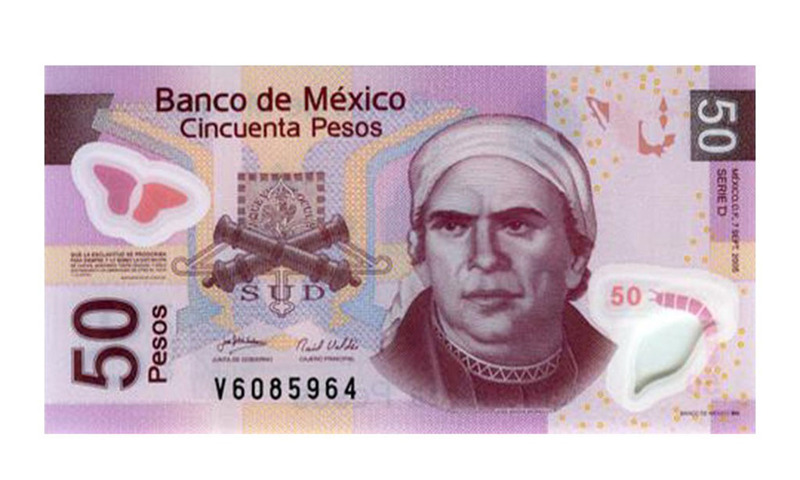 IMPORTANT NOTE: The same portrait of Benito Juarez will be used for the new 500-peso bill which will be further explained. Current fifty-peso bill . . .
and the word “SUD” (South), while the other one has neither. On the front the “Servant of the Nation”, José María Morelos y Pavón appears. A priest and hero of the Independence, who also fought to remove distinction of class and race in Mexico. 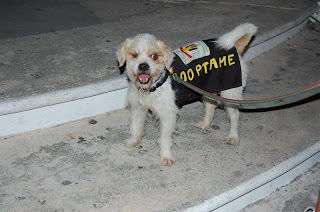 He conquered most of the south of Mexico. He organized the Congress where the first Constitution was created. Over his banner, two intertwined cannons. He wrote one of the most important political texts in Mexico, “Sentiments of the Nation”. Finely printed on the front “May slavery be banished forever together with the distinction of castes, all remaining equal so Americans may only be known by their vice and virtue”, Morelos. On the back, the Aqueduct of Morelia, State of Michoacán one of the most beautiful important and best preserved aqueduct in the country and Cultural Heritage of Humanity by UNESCO. The 1700-meters long baroque aqueduct is formed by 253 arches, almost 10 meters high was originally built in wood, clay and grass, and has been rebuilt several times since 1549. Also on the back the Mechuaca, “land of the fish”, a pre-Hispanic symbol for the State of Michoacán, and the famous Monarch butterflies that migrate every year from Canada and the US to Mexico. As most of the other new bills, this one is yet to be printed. There will be no historic character in it but it will celebrate the establishment of Tenochtitlan (ancient Mexico), will include an axolotl, maize and a scene from Xochimilco. See you next week when we will continue our trip across amazing Mexico with the time machine we handle every day. Al regresar de un viaje a otros países, con frecuencia una moneda o billete de esos sitios no se gastó o de alguna manera encontró la forma e quedarse en las carteras de los viajeros. 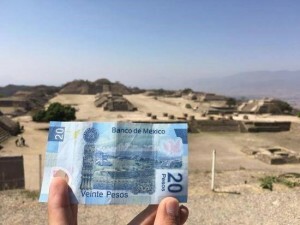 Algunos billetes cuentan con diseños increíbles y nos dicen mucho de la historia del país o de los próceres. Bien vale la pena echar un vistazo a los billetes mexicanos pues no solo muestran bellos paisajes, arquitectura y personajes que han tenido gran influencia en su pasado, sino que también nos enseñan sobre sitios, historia y cultura del país. 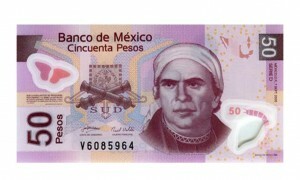 El pasado mes de Agosto nos enteramos que se introducía un nuevo billete de 500 pesos y que para el año 2019 la “Nueva Familia de Billetes” gradualmente sustituirá los que utilizamos en la actualidad en México. Estos nuevos billetes cuentan con medidas y elementos de seguridad más fuertes. La nueva serie de billetes representaran distintas etapas de la historia de México: México Antiguo, la Época Colonial, la Independencia, la Reforma y Restauración de la República; la Revolución y México Contemporáneo. El reveso de éstos billetes incluirá ecosistemas que representan de mejor manera al país y que son “Patrimonio Cultural” (UNESCO). Las denominaciones de la “Nueva Familia de Billetes serán: 50, 100, 200, 500, 1000 y, tal vez, el de 2000. Bien vale la pena mencionar que, en virtud de sus diseños, en más de una ocasión la International Bank Note Society ha elegido los billetes mexicanos como los más bellos del mundo; esperemos que los nuevos también se encuentren incluidos en esta distinguida selección. Si bien aún no hay una fecha definitiva para estos cambios y antes que digamos adiós a los billetes que utilizamos en la actualidad y demos la bienvenida a los nuevos, conviene que nos familiaricemos con lo que muestran, lo que significan y qué nos enseñan acerca de México, de manera que cuando vengan los cambios, evitemos sorpresas desagradables. Este billete, que aparecio en el 2007, desaparecerá y será sustituido por monedas de 20 pesos. Representando al Estado de Oaxaca, el frente muestra una pintura de Benito Juárez nacido en Guelatao, Estado de Oaxaca. El fue abogado, estadista, diplomático y presidente (5 administraciones) quien consolidó la Republica Mexicana; era liberal; encaró importantes dificultades con la Guerra de Reforma (separando la iglesia del estado); nacionalizó los bienes de la iglesia; dos intervenciones francesas; luchó contra la ocupación extranjera bajo Maximiliano, entre otras. Después de su muerte, el Congreso lo reconoció como Benemérito de las Américas. También muestra una balanza que representa al pueblo y la justicia, sobre las Leyes de Reforma y un ave. Al frente, en letras pequeñas: “Entre los individuos como entre las naciones, el respeto al derecho ajeno es la paz”, Manifiesto de la Nación, Julio 15, 1867. Al reverso: la bella y antigua ciudad de 20 km2 de Monte Albán, capital de los zapotecas; considerada uno de los primeros y más importantes sitios arqueológicos en Mesoamérica, fundada en el 500 AC y declarada por la UNESCO como Patrimonio Intangible de la Humanidad. En el inferior, Cocijo, el dios mixteco-zapoteco del agua. NOTA IMPORTANTE: La misma pintura de Benito Juárez aparecerá en el Nuevo billete de 500 pesos que se explica más adelante. Billete actual de cincuenta pesos . . .
celebrará el establecimiento de Tenochtitlán (México antiguo), incluirá al ajolote, maíz y un paisaje de Xochimilco. Nos vemos la próxima semana, cuando continuaremos con nuestro viaje a través del maravilloso México con la máquina del tiempo que manejamos todos los días.